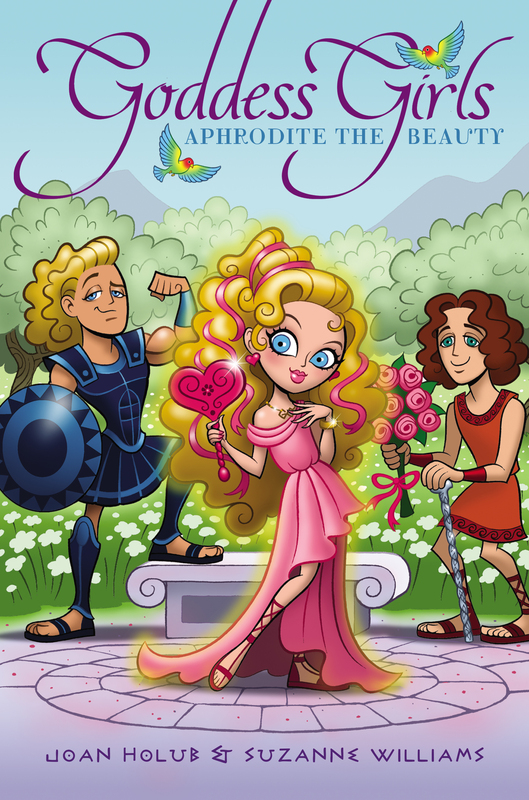 After giving Athena a makeover, Goddess Girl Aphrodite learns a thing or two about jealousy! Aphrodite delights in helping mortals find love, but she is definitely not delighted by the constant attention from the godboys at Mount Olympus Academy. So she comes up with the perfect plan to try and deflect some of that attention: She’ll help a fellow goddess girl, Athena, find her very first crush. After giving Athena a fabulous makeover, Aphrodite is suddenly an afterthought as the boys at MOA go gaga for Athena’s new look. And Aphrodite is a bit unprepared for just how much attention one of her best friends is now receiving. Can Aphrodite put aside her jealousy and be happy for her friend? APHRODITE SLID INTO HER SEAT IN MR. Cyclops’s Hero-ology class just as the lyrebell sounded, signaling the start of another day at Mount Olympus Academy. As she tucked her long golden hair, which was threaded with pink ribbons, behind her delicate ears, she was aware that every godboy in class was watching her. She hoped that in her rush to get ready that morning she hadn’t smeared lipstick on her teeth. Lifting her chin, she smiled at one of the godboys. Because he was a centaur, and therefore part horse, he stood at the back of the room. With four legs, it was too difficult to sit in a chair. Dazzled by Aphrodite’s attention and sparkling blue eyes, he blushed and glanced away. A few of the bolder godboys continued to gaze at her, however. Their adoration was plain to see. Ignoring them, Aphrodite reached into her bag and took out her Hero-ology textscroll. As the goddessgirl of love and beauty, she’d grown used to such admiration. Took it for granted in fact. All her life, godboys had found her enchantingly beautiful. It seemed they had only to look at her to fall hopelessly in love. That wasn’t her fault, of course. It was just the way things were. Aphrodite glanced across the aisle at Athena, trying to get her attention. All week, the class discussions had centered around mortal maidens and youths. She wanted to ask if Athena had heard the intriguing rumors about a maiden on Earth who could run as swift as the wind, faster than any youth—or even beast. But as usual, her friend’s nose was buried in a textscroll. Before Aphrodite could call out to her, Medusa, who sat directly behind Athena, leaned across the aisle. Her head writhed with hissing green snakes instead of hair. Their tongues flicked in and out as she poked Aphrodite with one of her long green fingernails. “You were almost late,” she sneered. “Troubles, Bubbles?” Medusa and her horrible sisters, Stheno and Euryale, never missed an opportunity to use the awful nickname to make fun of Aphrodite’s sea foam origins. “Not really,” Aphrodite muttered. She wasn’t about to admit she’d overslept. It would only give Medusa another reason to poke fun at her. Probably with jokes about her needing lots of beauty sleep. Fortunately, before her snaky green nemesis could say anything more, Mr. Cyclops finished with a student he’d been speaking to and stood up. As his humongous single eye swept the room, everyone fell silent. Aphrodite wondered what they’d be discussing today. Yesterday their teacher had asked how much and what kind of help they thought gods should give to mortals they favored. Aphrodite, who enjoyed helping mortals in love, had hoped to talk about that, but the godboys in class had immediately steered the discussion toward weapons and war—topics that could never hold her interest for long. Dropping her red feather pen in surprise, Aphrodite sat up straighter. Now this was an engaging question! She’d like to see the godboys try to make this into a discussion about weapons and war, she thought as she raised her hand high. “Yes, Aphrodite?” asked Mr. Cyclops. Aphrodite smiled at her. Poor Athena. She’d never really had a boyfriend. Just wait until she experienced her first crush. She’d think differently then. “If the maiden feels that way, then perhaps it’s only because she hasn’t yet found the right youth,” Aphrodite said kindly. Poseidon thrust his trident into the air. As always, water dripped from it and him to puddle beneath his chair. “That’s because many youths prefer the life of a soldier,” he declared. Normally, Aphrodite would have welcomed a chance to get out of class, but not today. Not when the topic of discussion was such an interesting one. Besides, the chariot safety assembly was repeated every year, and it was deadly dull. Who among them didn’t know that racing into a turn could cause a chariot to tip over? Duh. Or that you shouldn’t ever fly directly into the sun? After the assembly, which Zeus had livened up with a real demonstration of racing chariots for a change, it was time for lunch. Aphrodite was starved. As she stood in the cafeteria line with Athena and their other two best friends, dark-haired Artemis and pale-skinned Persephone, her stomach began to rumble like a volcano about to erupt. Her friends laughed. “Somebody’s hungry,” said Artemis. Aphrodite blushed. “Yes, very.” She didn’t say it loudly, but considering the response, she might just as well have shouted it. A dozen godboys in line ahead of her whipped around at the sound of her voice, eager to get her attention. “You can have my spot, Aphrodite!” yelled Poseidon from ten spaces up the line. He took a step toward her, dripping water onto another godboy’s sandal-clad feet. Ares, who was the cutest godboy in school in Aphrodite’s opinion, glowered at him. “Watch where you’re dripping, Fishface!” Droplets of water flew as he shook one foot and then the other. Poseidon glowered back, his mouth opening and closing like a fish’s. Aphrodite hesitated. Ares could be a bit of a bully at times, but she had to admit there was something about him she found . . . well, irresistible. He was just so muscular, so blond, and so blue eyed. Smiling uncertainly, she took a step in his direction. Atlas shrugged. “If you say so.” He set Hephaestus down, but not before a fight broke out between Poseidon and Ares. Ten minutes later, when she was seated at last with her three goddessgirl friends at their favorite table in the lunchroom, Aphrodite dipped her spoon into the delicious yambrosia. After she’d taken only a bite or two, however, she shoved the bowl away, too annoyed to finish in spite of her hunger. “Full already?” asked Artemis, as she dug with gusto into her own bowl. Her three dogs, a bloodhound, a greyhound, and a beagle, lay at her feet. They accompanied her everywhere. “I was talking about mortals,” said Aphrodite. “And anyway, just because a godboy fusses over you, it doesn’t mean he’s in love with you.” Indeed, she couldn’t help wondering if the handsome young godboys who fluttered around her like moths to a flame might disappear in a flash if she weren’t beautiful. There was no way to know because she’d always been . . . well . . . naturally pretty. “But most girls like it when boys fuss over them,” Athena persisted. She seemed oddly interested in the topic given her protest that “some maidens” would rather be left alone to study. “Who me? Ha!” said Athena. “That’s the last thing on my mind,” she murmured as she buried her nose in her Beauty-ology scroll again. Aphrodite traded amused glances with Persephone and Artemis, who then quickly moved on to talk about other things. But Aphrodite only half listened as she stared at Athena’s bent head. A straight-A student, Athena was easily the brightest of the four friends. She was also the youngest, though they were all in the same grade. Until this moment, Athena had never shown any curiosity about godboys, and they in turn, probably sensing her indifference, overlooked her. “No reason,” Aphrodite said lightly. But as Athena returned to her textscroll, the wheels in Aphrodite’s brain began to spin faster than the racing chariot Zeus had driven in assembly that morning. Within moments she concluded that Athena hadin fact been hinting that she’d welcome the attention of godboys. And while Aphrodite might be fed up with godboys’ annoying antics, she loved stirring up romance for others! True, things hadn’t worked out so well between Paris and Helen—that pesky Trojan War and all—but at least she’d tried to set them up. That’s it! she thought excitedly. If she could help mortals find love, then why not a goddessgirl, too? She could use her talents to help Athena find her first crush! But she would need a game plan. Aphrodite drummed her well-manicured, powder-pink-polished fingernails on the tabletop, sneaking glances at Athena’s long, unstyled, brown hair. At her face free of makeup. At her frumpy, plain white chiton. Suddenly an idea came to her. A makeover! That was exactly what her friend needed to make MOA’s godboys sit up and take notice. Now that she’d come up with a plan, Aphrodite couldn’t wait to get started!